Featuring 12 of Boogie Nights' Top Selling acrylic powder shades from five different stunning collections! EzFlow’s sparkling glitter acrylic powders are an array of intense and vivid colors in iridescent to metallic glitters. These exciting color combinations are guaranteed to brighten up any nail art or nail enhancement. A-Polymer powders paired with Polyester Holographic Film increases adhesion, strength and durability - a dynamic glittery duo that outshines the competition! 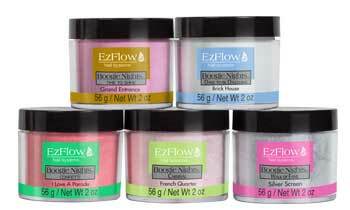 Our 12 Best selling Boogie Nights colors now available in 2oz size! Our advanced formulas utilize state-of-the-art technology, resulting in a resilient products which delivers durability as well as dazzle.